Tender And Sweet Fresh Little neck Clams! Dug Fresh And Brought In Daily By The Local Fisherman. Clam Knife • Fresh Mussels! • Fresh Steamer Clams! • Fresh Oysters! Whether you're making clams casino, clams and pasta, or just steamed with garlic and butter (our favorite!) 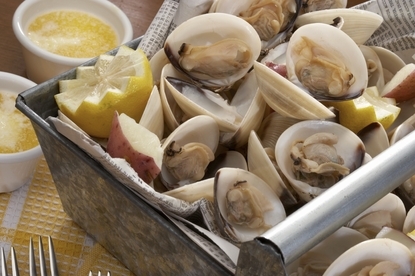 you won't go wrong with our Fresh Littleneck Clams! Little necks are shipped live in the shell. One order of "Necks" is one Quart. A quart is one and a quarter to one and a half pounds. There are typically 10-13 Necks per quart. Order Fresh Littleneck Clams By 10am EST, And Enjoy Them For Dinner Tomorrow!Our Little Neck Clams Also Make A Great Gift Idea For Your Favorite Seafood Lover! How Easy Is That! Wonderful fresh clams, easy to steam. Keep digging these and I will keep ordering them. Excellent quality, we ordered the clams and a bunch of other stuff for our Easter Dinner, Best We have ever had delivered hands down, and it was packed really well, you can tell these people care about their products! We loved the fresh clams and chowder, it was all great. The only downside is overnight shipping, it is expensive, but this company was far cheaper than the others I looked at. We will buy again. We got a bunch of stuff for tailgating, and it was all awesome! We cooked the clams up on a grill casino style, and we ran out! We'll be back in time for the next home game! Thanks Tommy the Cheesehead, Green Bay Wis.